The SKF spherical radial bearing has symmetric races to support radial loads while maintaining high speeds and rotational accuracy. It has a straight bore that fits conventional cylindrical shafts, and it has a CN (normal) radial internal clearance for applications that do not involve thermal expansion. Its steel cage evenly spaces the rollers for even load distribution and prevents contact to reduce friction, vibrations, and noise. This radial ball bearing is suitable for use in general purpose applications that primarily involve radial loads and minimal axial loads at relatively high rotational speeds. These include transmissions, motors, and pumps, among others. Specifications Main bearing dimensions ISO 104:2002 Basic dynamic load ratings DIN ISO 281 Dimensional and geometric tolerances ISO 199:1997, tolerance class PN Through-hardening steel for inner and outer rings and rollers ISO 683-17 Pressed sheet steel for cage (DIN) EN 10111:1998 Load carrying capacity and life ISO 281:1990 System for creating part numbers for rolling bearings DIN 623-1 Rolling bearings use rolling elements to maintain the separation between moving parts to reduce rotational friction and support radial and axial loads. These elements can be one of the following types: ball, cylindrical, spherical, barrel, needle, spindle, or tapered. All rolling bearings are open, shielded, or sealed. Sealed bearings are lubricated with oil or grease in the bearing factory, while open and shielded bearings are meant to be lubricated in place, with periodic reapplication of lubrication, based on use. The shield protects the working parts of the bearing from environmental debris that may be introduced and could reduce the ball bearing speed and lifespan. Rolling bearings are used in a range of applications from agricultural machinery to conveying equipment, robotics, dental equipment, elevators, rolling mills, ship rudder shafts, and aggregate crushers, among others. SKF Group manufactures bearings and units, seals, mechatronics, and lubrication systems that meet International Organization for Standardization (ISO) 14001 and 9001, and Occupational Health and Safety Assessment Series (OHSAS) 18001 standards for quality assurance. The company, founded in 1907, is headquartered in G teborg, Sweden. This Sealmaster FLBG Series three-piece spherical plain bearing is unsealed and corrosion resistant, and is suitable to accommodate pivoting and angular misalignment, such as in light-duty hydraulic cylinders that come in contact with chemicals or water that is acidic or alkaline. 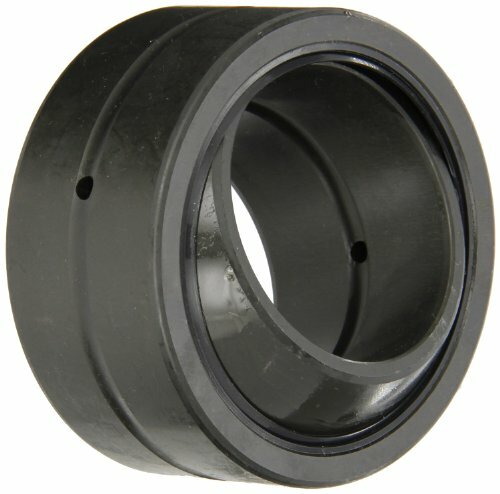 This bearing has a carbon steel outer housing with a larger outside dimension than other precision spherical plain bearings and is not dimensionally interchangeable with other spherical plain bearings. 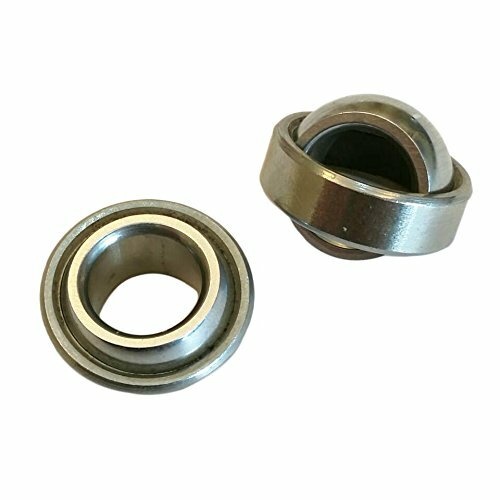 This bearing's carbon steel outer housing is coated for corrosion resistance, its one-piece bronze race is low friction, and the alloy steel ball is heat treated and chrome plated for wear resistance. 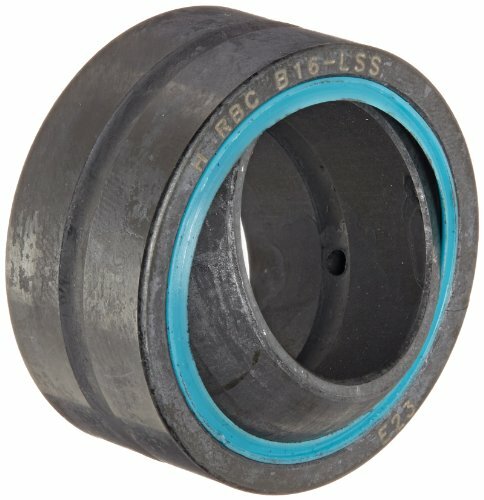 The race's inner and outer surfaces are precision ground to maximize surface-to-surface contact, lubrication grooves and holes direct grease into the bearing, its outer surface edge is chamfered to ease installation into the housing, and its wide cross section provides high misalignment adjustment. This spherical plain bearing is suitable for use in light-duty pivoting and angular misalignment applications in corrosive environments, such as in bottling equipment and mining machinery. Rolling bearings use rolling elements to maintain the separation between moving parts to reduce rotational friction and support radial and axial loads. These elements can be one of the following types: ball, cylindrical, spherical, barrel, needle, spindle, or tapered. All roller bearings are open, shielded, or sealed. Sealed bearings are lubricated with oil or grease in the bearing factory, while open and shielded bearings are meant to be lubricated in place, with periodic reapplication of lubrication, based on use. The shield protects the working parts of the bearing from environmental debris that may be introduced and could reduce the ball bearing speed and lifespan. Rolling bearings are used in a range of applications from agricultural machinery to conveying equipment, robotics, dental equipment, elevators, rolling mills, ship rudder shafts, and aggregate crushers, among others. Sealmaster manufactures bearings and bearing accessories. The company, founded in 1938 and headquartered in Elsmere, KY, meets International Organization for Standardization (ISO) standard 9001. 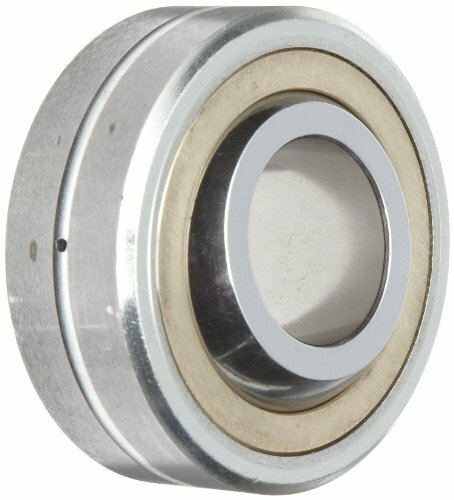 This RBC Bearings radial spherical plain bearing has seals on both ends and supports high oscillating radial loads, moderate axial loads in two directions, and moderate angular misalignments. The inner and outer rings are made of through hardened 52100 steel, which meets ASTM International standard A485 for strength, and the contact surfaces are ground and heat treated to a Rockwell hardness of HRC 56 minimum for resistance to wear. Surfaces are phosphate treated and coated with a dry film lubricant for static applications and occasional movements. The outer ring is single fractured (split) for simplified assembly and disassembly. The bearing has oil holes and lubrication grooves in both rings for lubrication in place. Lip contact seals at both ends help retain lubricants and exclude dirt and moisture. 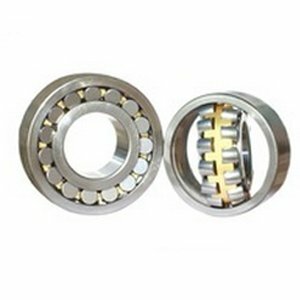 The bearing has a maximum operating temperature of 250 degrees F (121 degrees C). This spherical plain bearing meets American National Standards Institute/American Bearing Manufacturers Association standard ANSI/ABMA 22 for quality assurance, and is used in applications such as automobiles, construction equipment, and agricultural machinery, among others. RBC Bearings manufactures bearings, bearing components, and collets. The company, founded in 1919 and headquartered in Oxford, CT, meets International Organization for Standardization (ISO) standard 9001 for quality assurance. This SKF Explorer spherical roller bearing has a steel cage, a C3 radial clearance, and a straight bore suitable for applications that support high radial and oscillating axial loads, such as in a belt conveyor system. The two-piece pressed steel window-type cage has high wear resistance, and it spaces the rollers for even load distribution and prevents contact to reduce friction, vibration, and noise. A flangeless inner ring guides the cage. The bearing s C3 radial clearance is larger than normal for applications where impact loads and vibration are severe, or thermal expansion is a factor. The bearing's straight bore fits conventional cylindrical shafts. This bearing has two rows of symmetrically arranged rollers oriented on a concave raceway, which allow self-realignment and compensate for static and dynamic alignment errors, and it has a maximum operating temperature of 392 degrees F. This roller bearing is intended for interchangeability and meets Deutsches Institut f r Normung (DIN) standards for parts numbering, bearing dimensions, load ratings, tolerances, and clearances. It meets International Standards Organization (ISO) standards for hardening of bearing rollers and rings. This spherical barrel roller bearing is suitable for use in material handling equipment, electric generators, and machine tools. Specifications Main bearing dimensions DIN 635-2 Basic dynamic load ratings DIN ISO 281 Dimensional and geometric tolerances DIN 620-2, (ISO 492) tolerance class PN Steel composition for inner and outer rings and rollers ISO 683-17 System for creating part numbers DIN 623-1 Roller bearings use rolling elements to maintain the separation between moving parts to reduce rotational friction and support radial and axial loads. These elements can be one of the following types: ball, cylindrical, spherical, barrel, needle, spindle, or tapered. All roller bearings are open, shielded, or sealed. Sealed bearings are lubricated with oil or grease in the bearing factory, while open and shielded bearings are meant to be lubricated in place, with periodic reapplication of lubrication, based on use. The shield protects the working parts of the bearing from environmental debris that may be introduced and could reduce the ball bearing speed and lifespan. Rolling bearings are used in a range of applications from agricultural machinery to conveying equipment, robotics, dental equipment, elevators, rolling mills, ship rudder shafts, and aggregate crushers, among others. The SKF spherical radial bearing has symmetric races to support radial loads while maintaining high speeds and rotational accuracy. It has a straight bore that fits conventional cylindrical shafts, and it has a C2 radial internal clearance for applications that need less clearance than CN (normal) clearance and do not involve thermal expansion. Its steel cage evenly spaces the rollers for even load distribution and prevents contact to reduce friction, vibrations, and noise. This radial ball bearing is suitable for use in general purpose applications that primarily involve radial loads and minimal axial loads at relatively high rotational speeds. These include transmissions, motors, and pumps, among others. This GE20ES Spherical plain bearing is made of Bearing steel . It has a 20 mm inside diameter, a 35 mm outside diameter, and a 16 mm depth.This spherical plain bearing has a wide race cross-section for applications that support high misalignment adjustment. This bearing's inner and outer races are made of carbon steel for durability and resistance to deformity under heavy loads. This spherical plain bearing is suitable for use in pivoting, high load bearing applications, such as in heavy equipment suspensions and articulated joints. Rolling bearings are used in a range of applications from agricultural machinery to conveying equipment, robotics, dental equipment, elevators, rolling mills, ship rudder shafts, and aggregate crushers, among others. This SKF Explorer spherical roller bearing has a steel cage, a C3 radial clearance, an outer ring with center lubrication groove and three oil holes, and a 1:12 tapered bore suitable for applications that support radial and oscillating axial loads, such as in a belt conveyor system. The two-piece pressed steel window-type cage has high wear resistance and spaces the rollers for even load distribution and prevents contact to reduce friction, vibration, and noise, and the cage is guided on the inner ring. This roller bearing's C3 radial clearance is larger than normal for applications where impact loads and vibration are severe, or thermal expansion is a factor. The bearing's 1:12 tapered bore compensates for flexing shafts and fits tapered shafts. This bearing has two rows of symmetrically arranged rollers oriented on a concave raceway, which allow self-realignment and compensate for static and dynamic alignment errors. The bearing has a maximum operating temperature of 392 degrees F. This roller bearing is intended for interchangeability and meets Deutsches Institut f r Normung (DIN) standards for parts numbering, bearing dimensions, load ratings, tolerances, and clearances. It meets International Standards Organization (ISO) standards for hardening of bearing rollers and rings. This spherical roller bearing is suitable for use in material handling equipment, electric generators, and machine tools. The SKF spherical radial bearing has symmetric races to support radial loads while maintaining high speeds and rotational accuracy. It has a bore with 1:30 taper for compensating for flexing shafts and fits to tapered shafts, and it has a CN (normal) radial internal clearance for applications that do not involve thermal expansion. Its steel cage evenly spaces the rollers for even load distribution and prevents contact to reduce friction, vibrations, and noise. This radial ball bearing is suitable for use in general purpose applications that primarily involve radial loads and minimal axial loads at relatively high rotational speeds. These include transmissions, motors, and pumps, among others. This SKF Explorer spherical roller bearing has a steel cage, a CN radial clearance, an outer ring with center lubrication groove and three oil holes, and a straight bore suitable for applications that support radial and oscillating axial loads, such as in a belt conveyor system. The two-piece pressed steel window-type cage has high wear resistance and spaces the rollers for even load distribution and prevents contact to reduce friction, vibration, and noise, and the cage is guided on the inner ring. 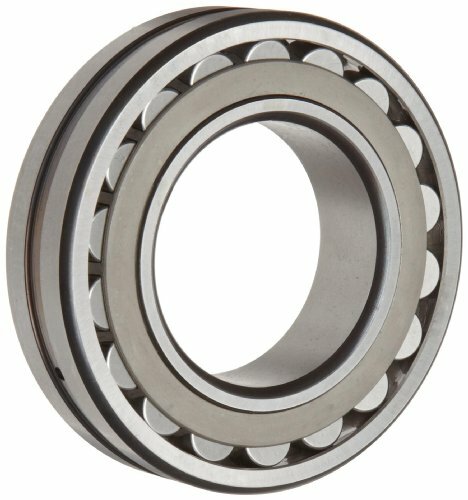 This roller bearing's CN (normal) radial clearance is for applications where thermal expansion does not reduce clearance. The bearing's straight bore fits conventional cylindrical shafts. This bearing has two rows of symmetrically arranged rollers oriented on a concave raceway, which allow self-realignment and compensate for static and dynamic alignment errors. The bearing has a maximum operating temperature of 392 degrees F. This roller bearing is intended for interchangeability and meets Deutsches Institut f r Normung (DIN) standards for parts numbering, bearing dimensions, load ratings, tolerances, and clearances. It meets International Standards Organization (ISO) standards for hardening of bearing rollers and rings. This spherical roller bearing is suitable for use in material handling equipment, electric generators, and machine tools. This SKF GE series radial spherical plain bearing is double sealed and is suitable for pivoting, high load bearing applications where angular misalignment is required, such as in hydraulic cylinder rod ends. Its outer race has a single fracture for ease of inner ring installation, its inner and outer rings have grooves and oil holes for ease of lubrication, its double Nitrile seals keep out contaminants, and its wide inner ring cross section provides high misalignment adjustment. This roller bearing's CN (normal) radial clearance is for applications where thermal expansion does not reduce clearance. 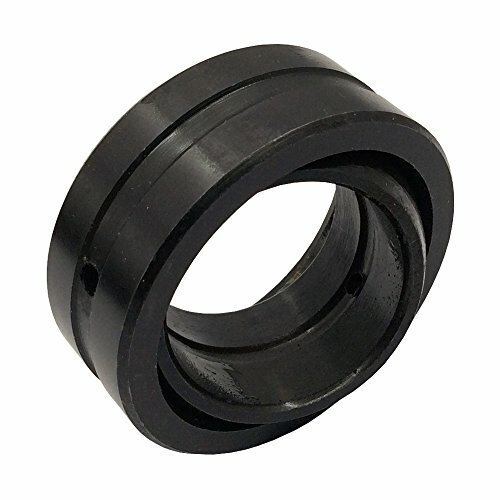 This bearing's inner and outer rings are manufactured from through-hardened carbon chromium steel and heat treated to increase hardness for optimum wear resistance. Its spherical contact surfaces are precision ground to maximize surface-to-surface contact of inner and outer rings. This bearing is phosphate treated prior to coating with a dry film lubricant for corrosion resistance and it has an operating temperature range of -22 to 266 degrees F (-30 to 130 degrees C). This spherical plain bearing is suitable for use in vehicle suspensions and heavy equipment articulated joints. 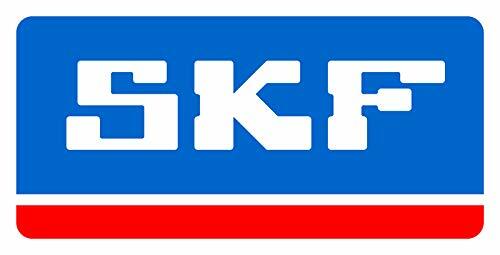 SKF manufactures bearings, seals, and lubrication systems for automotive, OEM, energy, and other industrial applications. The company, founded in 1907, is headquartered in Gothenburg, Sweden, and meets International Organization for Standardization (ISO)/TS 16949, ISO 14001, and ISO 9001 standards for quality assurance.